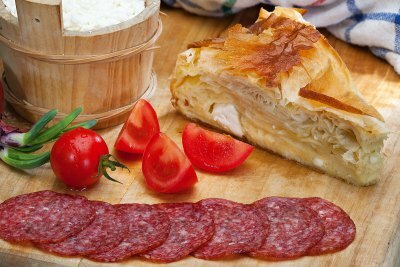 If you wanted us to name a dish found nowhere else but in Serbia, we would say gibanica – a pie who has “sisters” all over the region, but which is unique to Serbia. And you can describe it with only these words – finger licking! Whisk eggs with some sparkling water in a bowl, then add oil and crumbled cheese. Mix it well and then add sour cream. Mix again. Oil the baking dish and line the sheets of filo pastry. First put one layer of filo pastry at the bottom of the dish, then crumble two of them,dip them in the mixture and then spread across the dish. Put one layer again, then spread two crumbled dipped ones and repeat until you run out of the mixture. Save one layer of pastry to put on top. Pour the remaining oil over the top layer. Bake in preheated oven on medium heat until golden brown. Serve while hot. Enjoy!